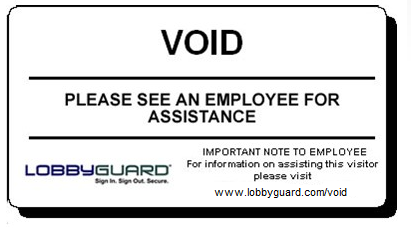 Log in to LobbyGuard FrontDesk at frontdesk.lobbyguard.com and click on the "Administration" section on the left side of the screen, then click on "Workflows" to show your workflow settings. In the Workflow column on the right click the option labeled "Perform Background Check" as shown below. Scroll to the bottom of the Workflow column and click "Save Workflow" to save these settings. Repeat these steps for any other visitor types / reasons for visit that you wish to perform instant background checks. In the Name field enter "Background Failure" and in the Description field enter "Notifications to send for visitor background failure". Click the Trigger field and choose "Failed Background Check" from the list provided. Select the kiosk(s) for which this rule should apply. If you have only one kiosk you will only see one selection and you should check the box to the left of that kiosk name. If you have more than one kiosk you can choose all kiosks in your group or you can set up a separate rule to send notifications to each individual kiosk. This feature allows you to set up a rule that notifies one group of people for some kiosk and another group of people for another kiosk. If you wish to notify one or more persons by email click the "Email" checkbox in the "Actions" list and click the "show" link that appears. If you wish to notify one or more persons by text message click the "Text Message" checkbox in the "Actions" list and click the "Show" link that appears. Scroll to the bottom of the Rules area and click the SAVE button. You will see a message indicating that your new rule has been created. On the left side of the screen click ADMINISTRATION then click RULES and you will see your new rule listed. Click the box in the "Enabled" column for each source of background data that you wish to check. If you do not wish to check for a certain type of background you can leave the box unchecked. Click the "+" button in the top right portion of the Red Flag List to create an entry and you will see the following screen. Enter all the information you know about the person you wish to add to Red Flag. IMPORTANT: You must enter at minimum a First Name and Last Name. In the Notes field you should enter a note detailing why this person is in the Red Flag List. Click the SAVE button when complete. You will see the Visitor Detail view. Scroll to the bottom of the screen and you will see the ADD TO RED FLAG LIST button. Click this button and this visitor record will be moved to your Red Flag List. Your LobbyGuard product is now set up for background checking. The next step is to understand what happens when a visitor fails a background check in LobbyGuard. This will also involve setting appropriate policies and guidelines that best fit your environment. 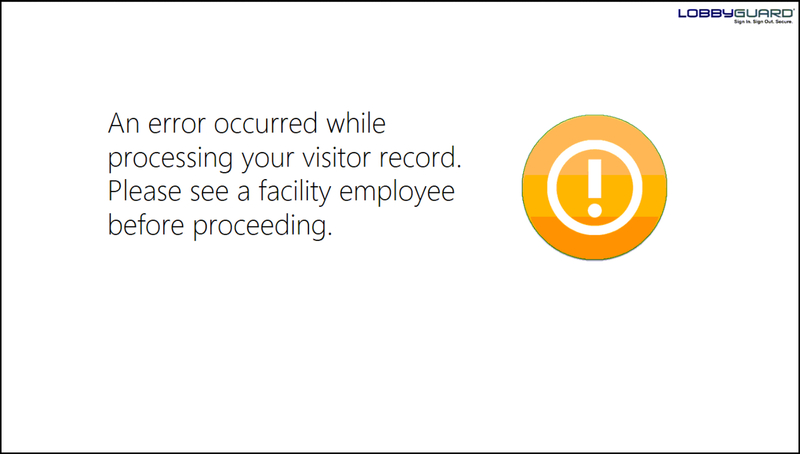 The visitor is informed on the kiosk screen that an error has occurred during sign-in. This screen provides a view of the visitor at the top and the offender to whom this visitor was matched directly below. Use the information on this screen - including the photo, the facial recognition, address and physical characteristics such as height, hair and eye color - to determine if the visitor is a match to the offender. Click on the MATCH or NOT A MATCH button located on the offender row to indicate your decision. IF THIS IS NOT A MATCH - If the information on the visitor does not match the offender e.g. photos don't look similar, physical characteristics aren't similar, etc then you should click the red "NOT A MATCH" button located on the same row as the offender detail. Three things will happen when you click the "NOT A MATCH" button: the visitor will receive a visitor badge from the kiosk badge printer, the visitor will be moved from your "Denied" visitor log to your "Signed In" visitor log, and LobbyGuard will remember this visitor for future visits and will not match this visitor to this particular offender record. IF THIS IS A MATCH - if the offender and visitor are the same person click on the MATCH button. At this time you should follow the policies and procedures you have established for dealing with an unwanted individual in your building. Make sure Red Flag is enabled then click the View button to access the Red Flag list. Click the '+' button to Add to Red Flag List. First and Last name are the only required fields to add a visitor to the Red Flag List, click Save when finished. From the LobbyGuard kiosk press the START button then press the visitor type and reason for visit for which you have enabled "Allow the visitor to bypass the license scan". During the sign-in you will be presented with the driver license scan screen video. Select the option "I do not have a license" and enter the name and DOB for which the Red Flag was created during Step 4. This screen provides a view of the visitor at the top and the offender to whom this visitor was matched directly below. Use the information on this screen - including the name, address, and physical characteristics such as height, hair and eye color - to determine if the visitor is a match to the Red Flag.